Viridian is a registered charity providing social housing and affordable accommodation across the UK. This includes the provision of student halls of residence and youth hostels in London and the South East. 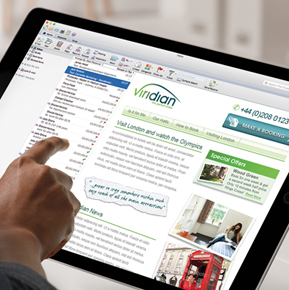 Viridian approached us to help improve the marketing of their student halls of residence which are a cost effective accommodation offering available during periods of inoccupancy in the university holidays. Black Pig's task was to develop a strategy which would enable Viridian to grow this valuable aspect of their work and maximise the fill rate for rooms in order to increase profitability. We began with a research phase during which we gathered information about the client's own accommodation and similar offerings from other educational institutions and competitors. We explored the likely audiences for this type of accommodation and analysed the strengths of the service Viridian offered and the opportunities within the marketplace. Once we had put together a draft marketing plan, we presented this to our client along with creative design work to support our recommendations. This included the development of a new strapline, website concepts and digital marketing template.